In my last post, I wrote about growing up in Kentucky, and wearing Bass Moccasins. I even found a picture of them which I incorporated, none too professionally. They were definitely part of the armor/uniform I and my friends wore. I now live on a semi-rural island in Puget Sound, about thirty-five miles from Seattle. Since my wife and I moved here about 11 years ago, I have had little reason to go to Seattle except to see friends, go to doctor appointments (for specialties not represented among our local health care providers,) and make side trips to Costco and Trader Joe’s. Daily commuting is in my past, as is wearing professional clothes. I don’t remember the last time I wore a tie or a dress shirt. Hell, I don’t remember the last time I bought new clothes, although I bought a pair of pants at a thrift shop earlier today. We have a number of thrift shops, each supporting local non-profits. There seems to be an unstated contest among those in my social circles as to who can find the greatest bargains at these stores. Women usually win as there are more women’s clothes than men’s available. There is no need to dress up, or sometimes even get dressed, when one’s day is spent in front of a computer screen or sitting in a chair reading a book. One does not put on a suit to work in the garden, walk on the beach, or have coffee or lunch with a friend. We live a casual, laid back life. Our armor consists of hybrid cars, old clothes, gardening gloves, casual shoes. A person in a business suit or even a coat and tie is immediately assumed, for no reason other than his/her external dress, to be (a) an outside salesperson, probably for insurance; (b) a lawyer on the way to or from court; (c) a mis-dressed tourist; (d) a religious missionary. Whatever the actuality is, the person is assumed to be “other,” not from “around here.” They are still treated with friendly and courteous hospitality, but also with just a smidgeon of pity for having to wear such uncomfortable clothes. Perhaps I live where I do because I have never really liked spending money on clothes. It’s not that I didn’t like to dress well, although I was always more interested in personal style rather than trends set by others. Perhaps my clothing choices reflected my general distrust of authority and tendency toward (mild) rebellion. And now that I am older, and retired, I don’t care as much about what other people think when they see me than I did when I was working and attempting to establish a professional persona. People still judge, we all do, but now the clues they have tend to be non-visual — words on a page or computer screen, actions at a meeting or as a volunteer, Skype calls. My main work is being a caregiver for my wife, writing, and volunteering. None require any particular form of dress, although there are times I think I use my computer the same way many people use a camera or a smart phone — to put a degree of distance between whatever is happening and myself. I am still there, still participating to a degree, but as an observer and perhaps recorder than an actor. I am there, but I have no responsibility for what is going on or the results. It’s often a comforting and comfortable position to be in. 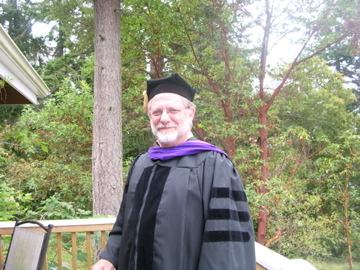 I do have academic robes for graduation ceremonies in I participate as either an instructor or an administrator. I have been both. The robes are also a form of armor, in that they separate me from others in the room, with the hood and tam identifying rank. Twitter, Facebook, LinkedIn, Pinterest, and social media are also forms of armor, in the metaphoric sense of a protective covering. If I am engaging with social media, displaying vulnerability through my openness in sharing my life and thoughts I am identifying with those who read my posts, who share their lives, who are active in social media. The content of our sharing may be important or mundane. That is of less importance than the fact we are sharing. Our armor in this arena, this context, is our involvement, our vulnerability. Last month I was watching a football game – yes, I am a sports fan. A commercial came on showing various women, all extremely attractive, in different situations – a businesswoman, a mother holding a child, a student. All had intense looks on their faces and were wearing clothes not usually seen on women — football jerseys complete with shoulder pads. It was a commercial for NFL clothes for women. A way to combine sports armor, marketing, and retail sales. I am not sure why I was surprised by it, other than wondering why it took so long for the marketing gurus to come up with the sales pitch. I did, however, find the whole idea a bit repugnant and depressing, but then I feel that about a lot of things I see being sold on TV, and other forms of mass media. My thoughts on the consumer society, however, is a topic for another time.